Ancient Stones - Borders - 005 Standing Stone, Cardrona, Peebles. 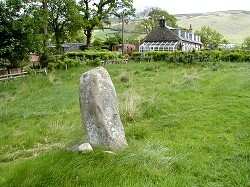 005 Standing Stone, Cardrona, Peebles. This lone standing can be found in a small field or horse paddock just to the west of Cardrona Mains farm, some 3 miles east from Peebles. The stone is situated on the crest of a scarp representing an ancient raised river-bank and reaches a height of 1.40m and leans slightly to the north. There are two routes to this location, both from Peebles. Taking the A 72 eastwards, turn right into the new village of Cardrona. Alternatively, take the B7063 on the south bank of the River Tweed, turning left at Cardrona. Along road-side beside gate leading to stone. Little is known about this solitary standing stone. It stands in a small paddock at Cardrona mains Farm, a few miles east of Peebles and the lean, I suspect, is due to horses dealing with itches in those parts that are hard for horses to reach! My theory about this stone is that it may mark the route to Horsburgh Ford an ancient crossing point on the River Tweed. The ford was once known as the Crossford. 002 White Stone, Innerleithen Road, Peebles.